Now I’m well and truly back in Perth, Australia (having finally adjusted to being in the same time zone as everyone around me) I thought I’d do a bit of a recap of my holiday. 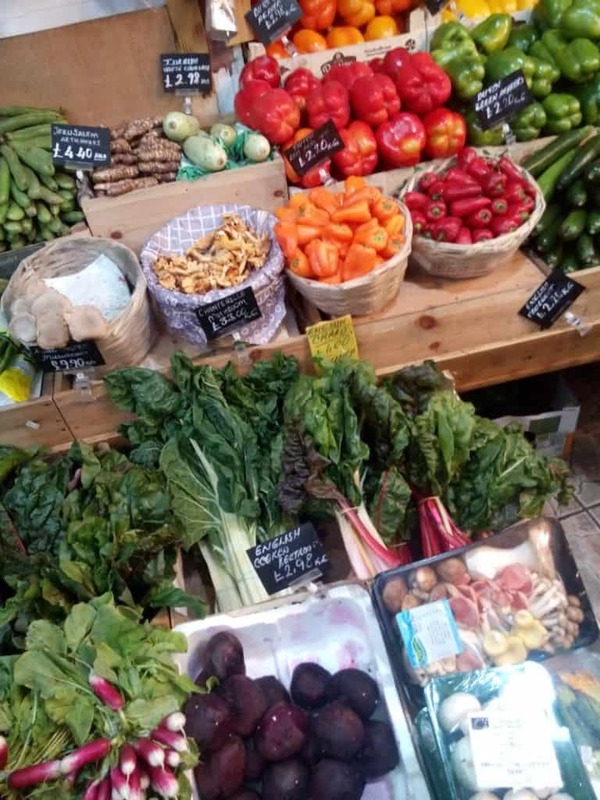 No, I don’t mean a whole heap of holiday snaps featuring stunning sunsets, glorious landscapes or what I ate for dinner, but rather all the cool stuff I saw relating to living sustainably on the European and English side of the world. Far more interesting, don’t you think?! 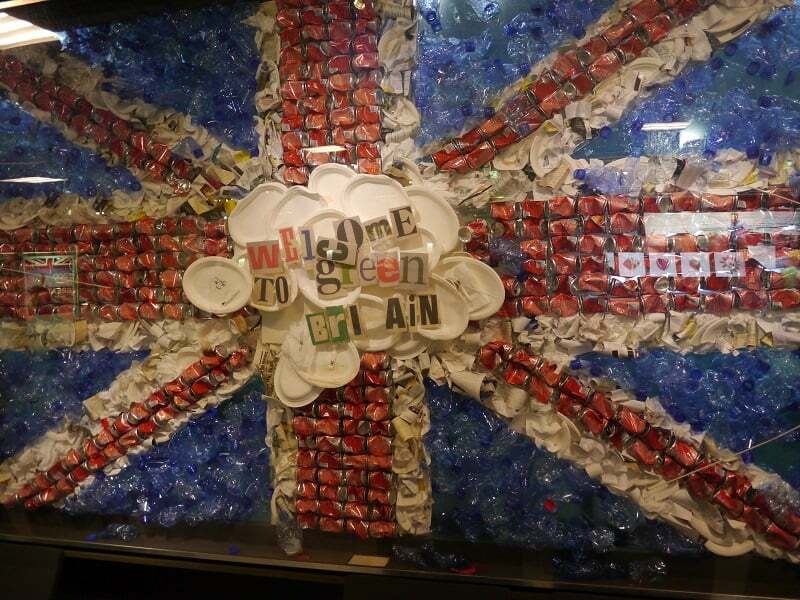 I’ve only been away for two years, but I’d forgotten how much further along Europe and the UK are down the path of making sustainability a mainstream topic, and how much more people seem to embrace it! 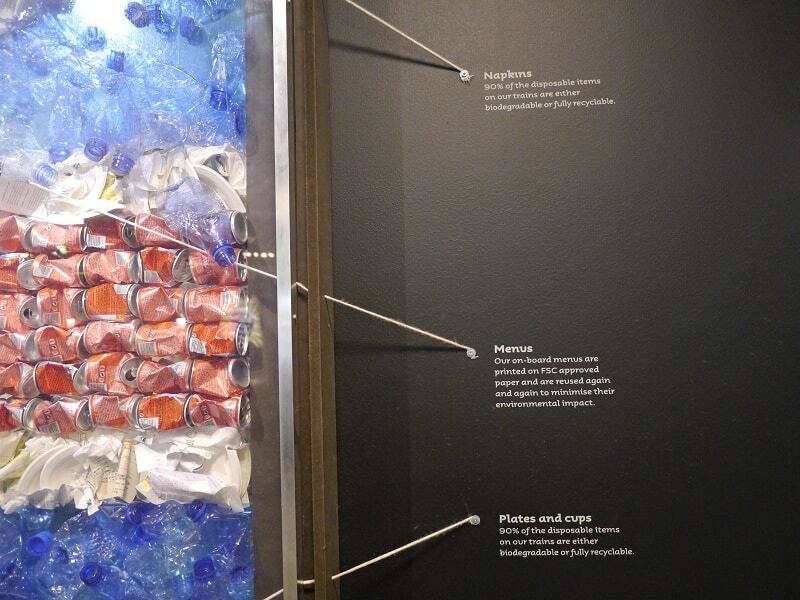 I found it hugely inspiring to see how individuals, community groups, small businesses and even big chains were trying to do their bit to reduce their impact on the environment. Hopefully this is a sign of what’s to come for this side of the world. Bring it on, I say! Bulk stores pop up in surprising places, and more often than you might think, if you only keep your eyes open for them! 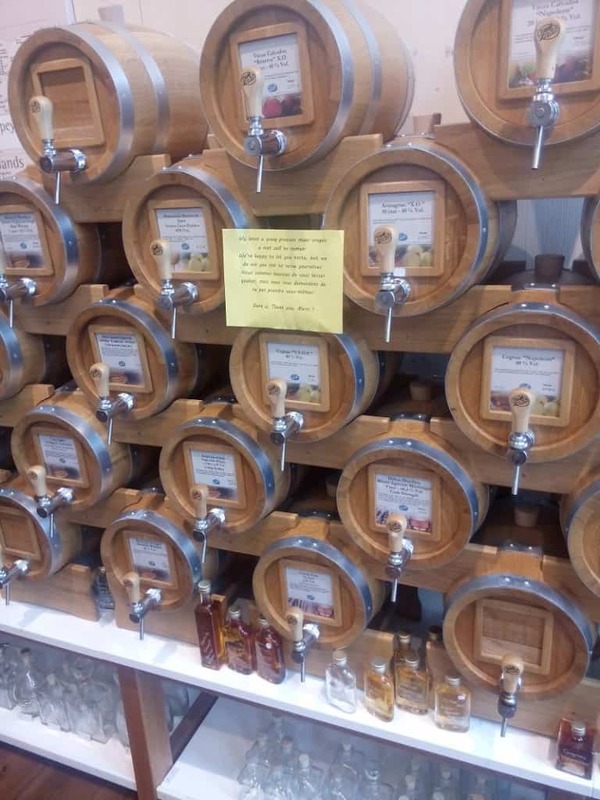 Bulk buy spirits! These barrels contain cognac and other alcohols. You can find everything in bulk if you look hard enough! 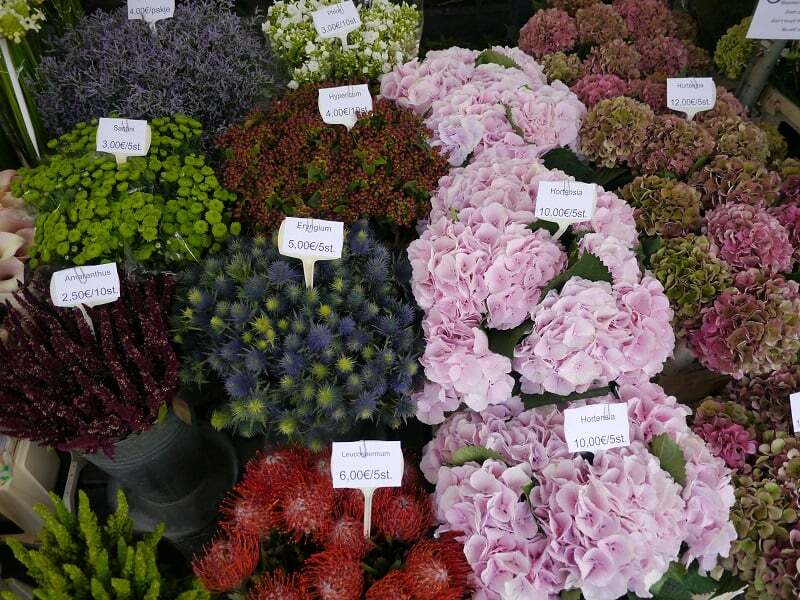 Farmers Markets are always inspiring, but what I particularly loved about this one was all the loose blooms you could buy without all that unnecessary plastic to accompany them. 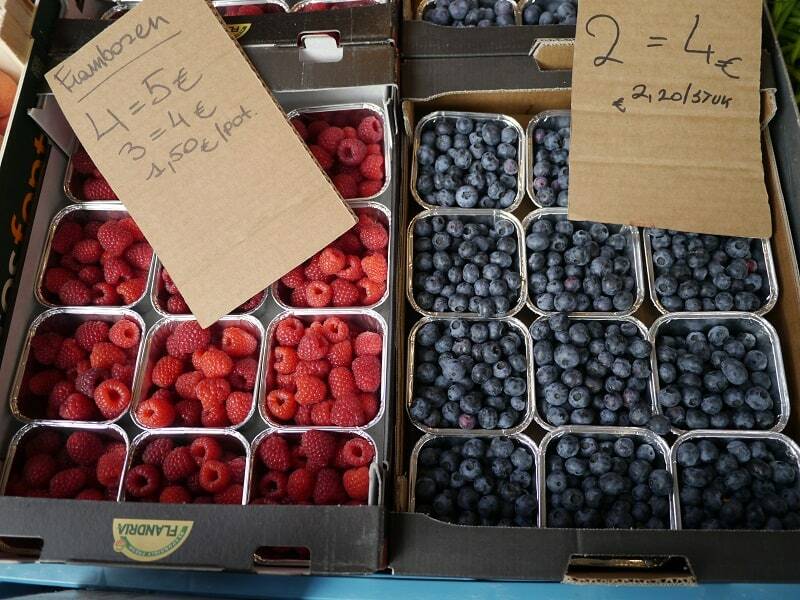 These berries at the market were packaged in aluminium foil punnets rather than plastic ones. These punnets have more potential for reuse than plastic ones, plus foil is far easier to recycle than plastic. Bonus points for signs made out of old cardboard! I loved how much fruit and veg was available loose and unpackaged from this greengrocer in London. Even fancy mushrooms come without uneccessary plastic bags. 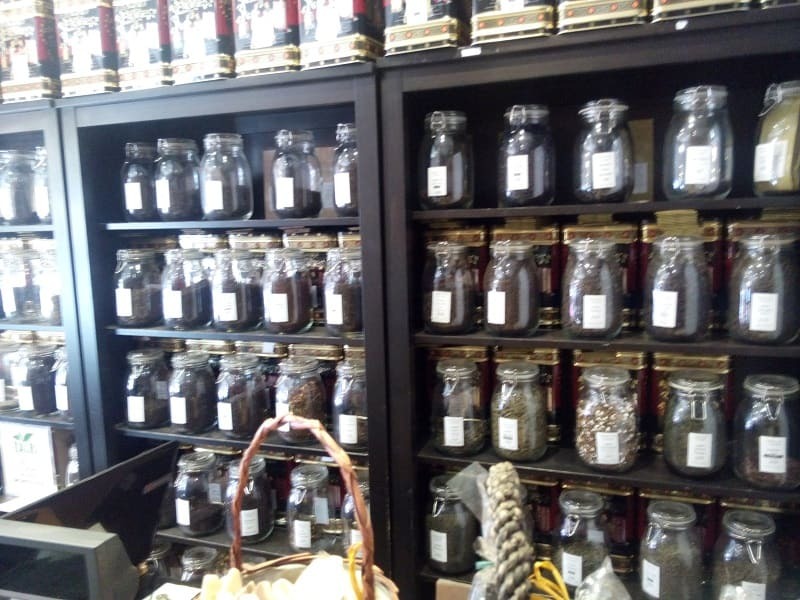 Bulk buy tea at a shop in York. 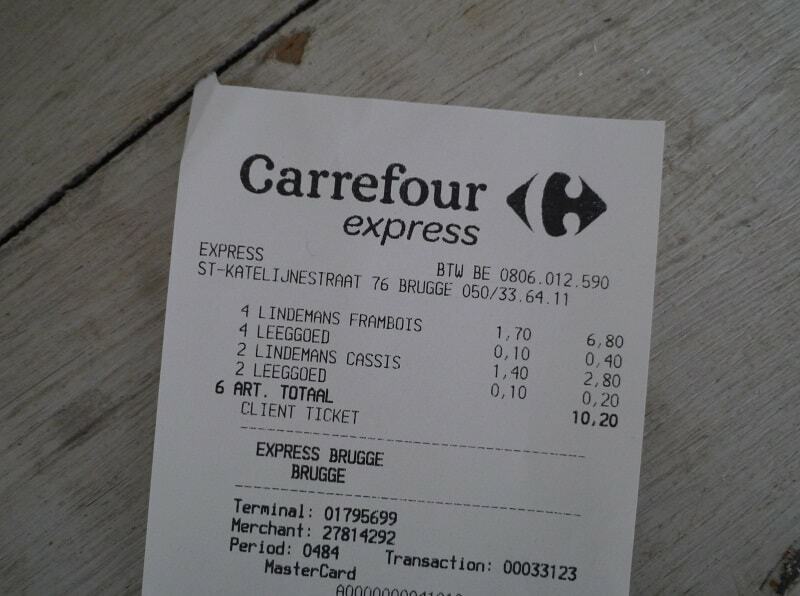 And my, what a lot of tea they had! 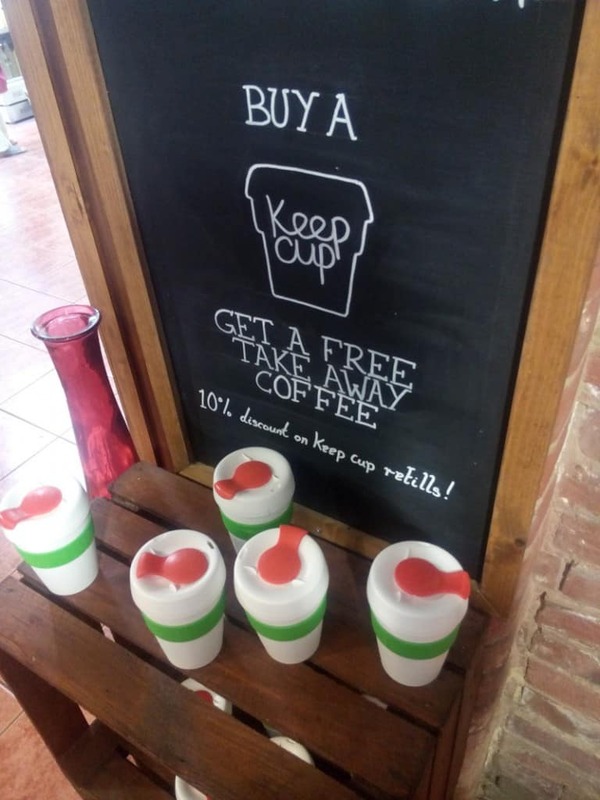 KeepCups might have been invented in Australia, but it’s good to see that they are catching on across the other side of the world too. 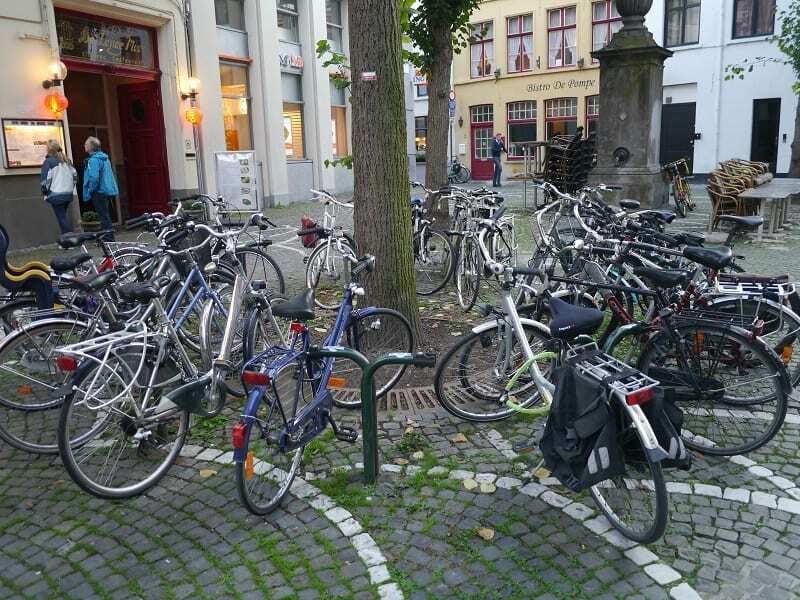 Bicycles rule in Europe, regardless of the weather. Less cars and more bikes and everyone benefits! 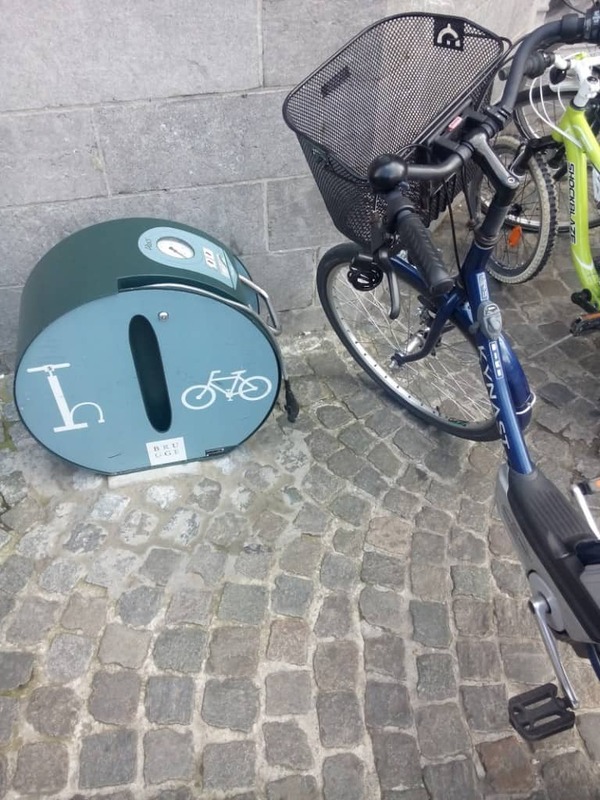 Free air for pumping up your bike tyres! Cycle infrastructure at its best. 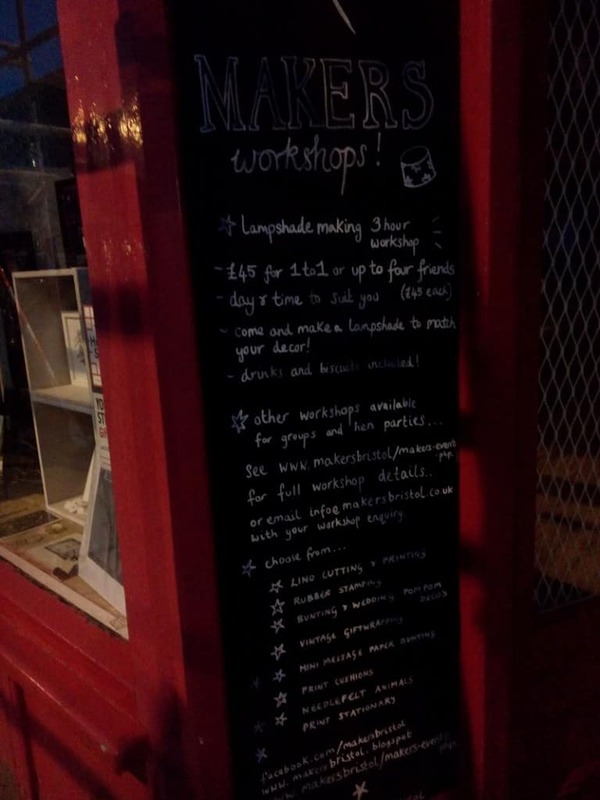 There are so many community-led initiatives all over the UK, but it was particularly great to see new things popping up in my old haunt of Bristol. 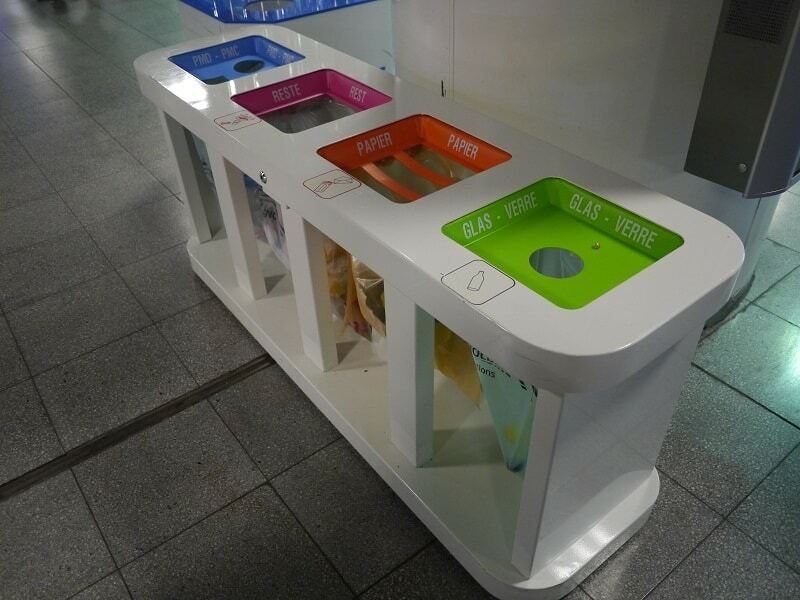 Bin systems like this one were almost everywhere in Europe and the UK, making it easier than ever for people to dispose of their waste responsibly. Much better than one “landfill” dumpster! 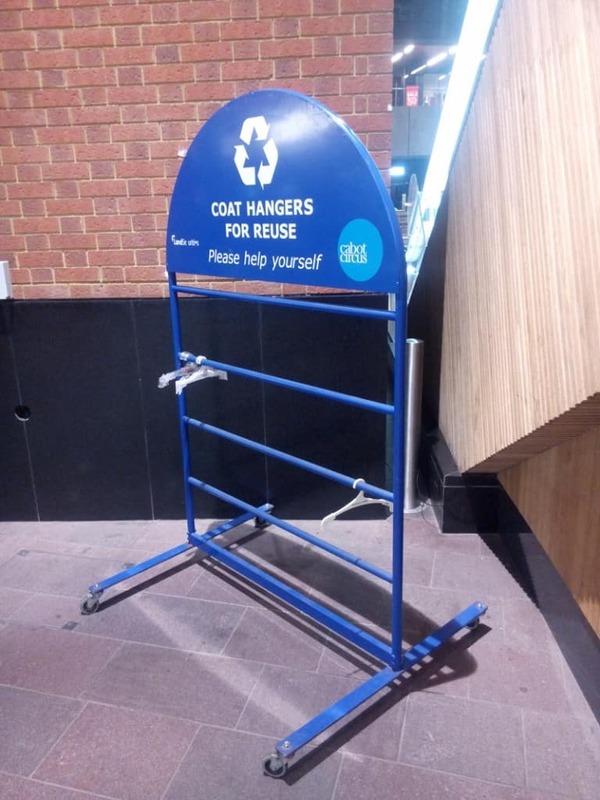 Even the local shopping centre was doing its bit, offering unwanted coat hangers to the public for free to stop them heading to landfill. Almost every company, no matter their size or industry, has some kind of statement publicly available about how they try to be sustainable. 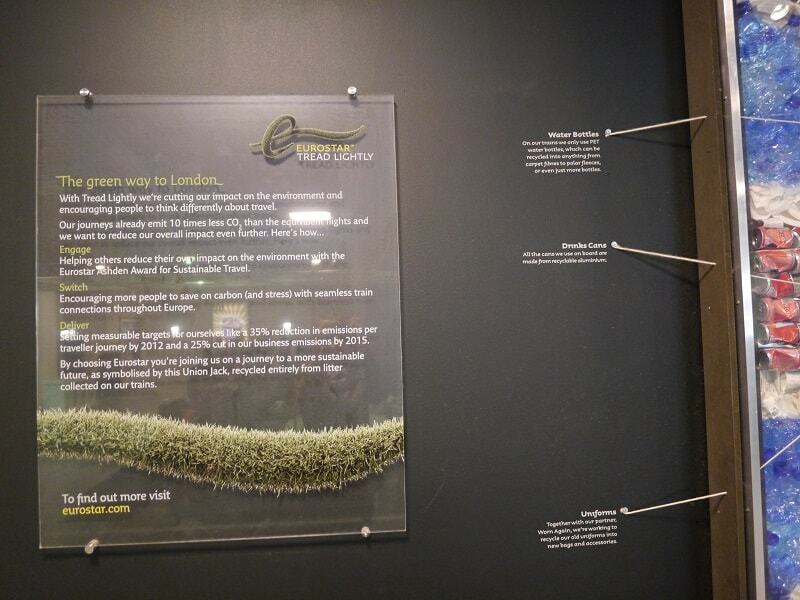 Most people are aware than train travel has far less impact on the environment than flying, but its good to see companies addressing these issues and telling people what they are doing to make a difference. 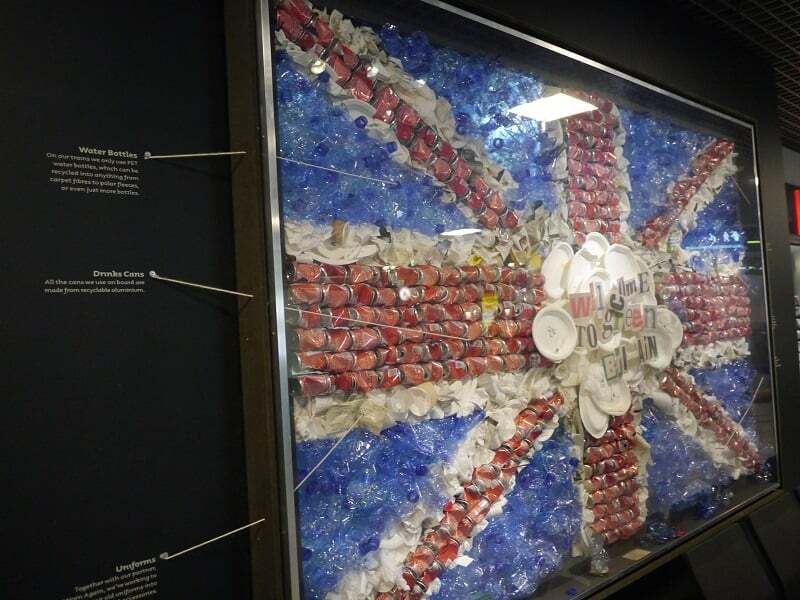 I might not agree with the amount of waste being generated, but I was impressed that they are actually thinking about what they are doing – it’s a step in the right direction. What can I say…it’s a start! I noticed that lots of restaurants offer filtered water in refillable glass bottles rather than plastic bottles. 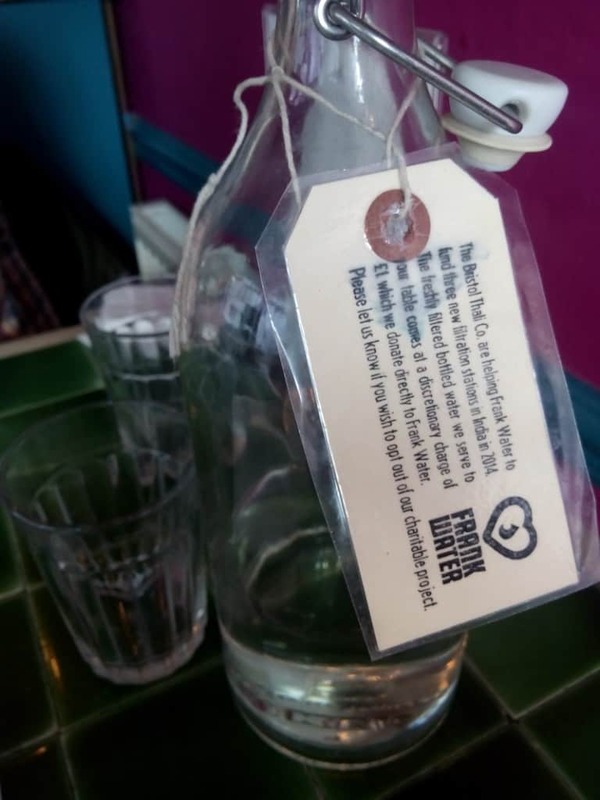 I loved this scheme at the Thali cafe in Bristol where customers pay a donation for filtered water, which goes to funding water projects in India. 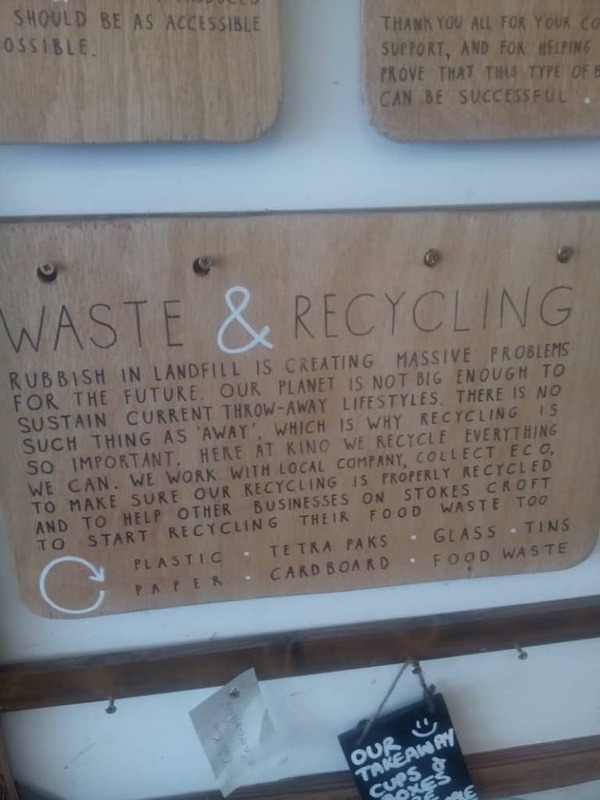 The waste and recycling statement hanging proudly on the wall of a local Bristol cafe. 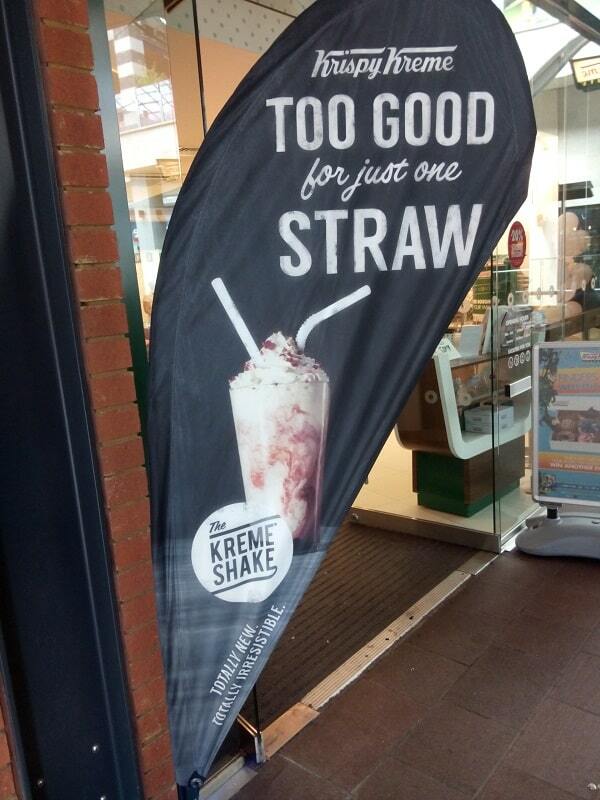 …but it’s something that’s actively worked towards. 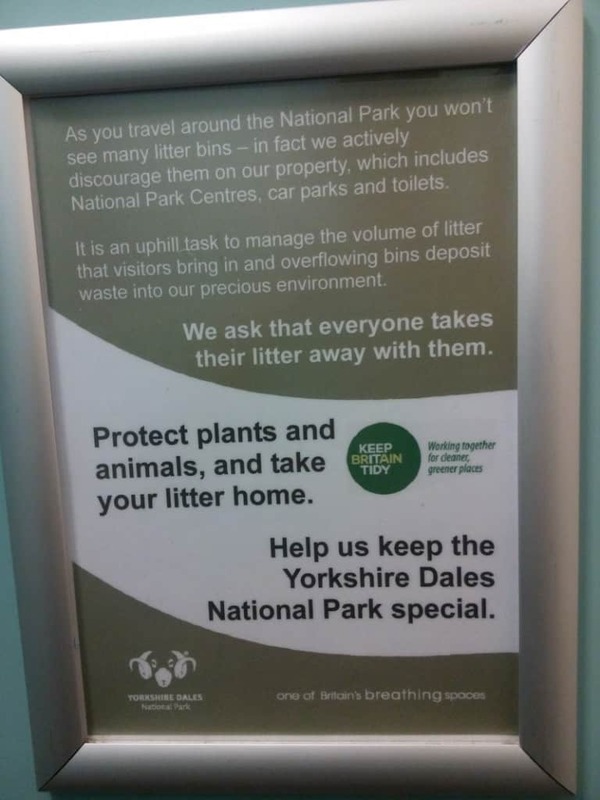 No litter bins encourages people to take their litter home. Whilst there was so much good stuff to see, it wasn’t all perfect. Here are just a few examples of things that made me want to tear my hair out. 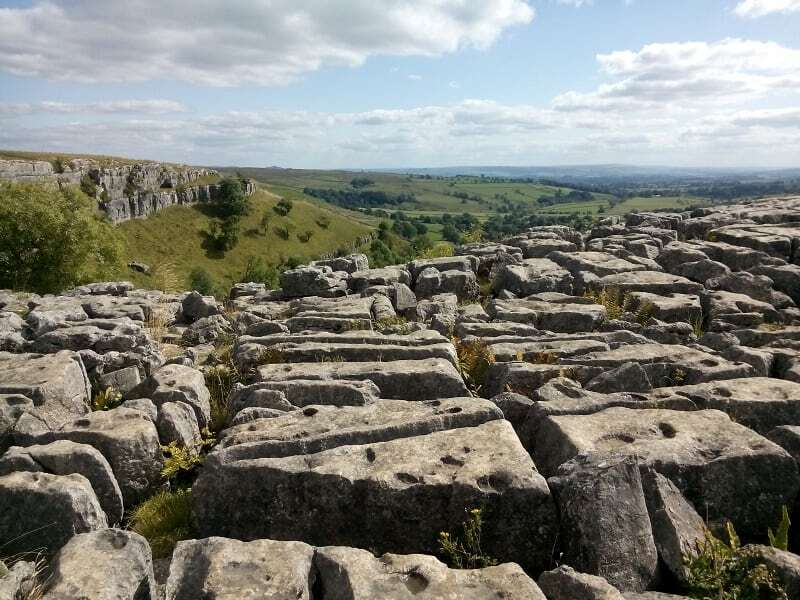 We stayed in a hotel in Yorkshire that I chose because of its commitment to green principles, use of local produce and ethical credentials. It was the height of summer when British fruit is in abundance. So why on earth were they providing apples shipped all the way from New Zealand?! Arghh! This shop has to be my worst nightmare! Even the name sends a shiver down my spine! As you can see, there were so many things that made me feel really inspired. Most of them are little things, but all of these little things add up to make real change! It made me realise that increasingly, people, companies, businesses and groups “get” that they need to act more sustainably, and they are embracing it and having fun at the same time! Of course, there are also those hair-pulling moments that make me realise whilst we are heading in the right direction, there is still plenty more work to be done! Excellent report !! So good to see people are willing to learn and they are encouraged to change . We need ambassadors like yourself to follow .Thanks for your endless work , courage and sharing . Could you please let me know where can i purchase vinegar and bicarb in bulk here in Perth ? Aw, thank you so much! 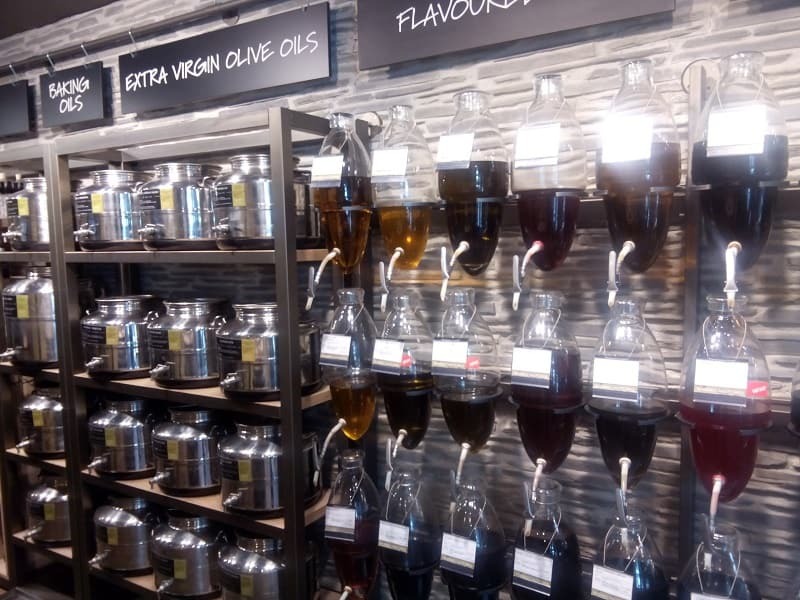 I buy bulk vinegar at Planet Ark in Fremantle. 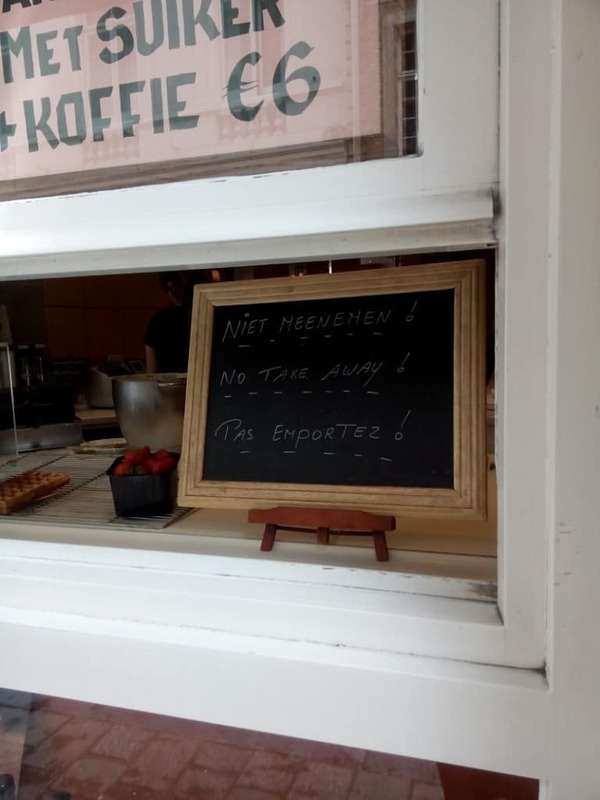 My only frustration is their limited opening hours – they are only open for a few hours on Sat morning and not on Sundays. I think they sell bicarb in bulk too, but I’m still making my way through a big cardboard box I bought from (ahem) the supermarket that I have had forever. It’s on its last legs now though, so I will have to go and check! This is inspirational :) Thanks for sharing. I love the holiday snaps! Keep ’em coming. Somehow I fell off the notification list for your blog, so I’m going to re-subscribe. You can share all the holiday photos you want these were wonderful. I would give anything to have bulk food sections like you found, maybe closer to my new home but I won’t hold my breath. I’m with you on the apples. 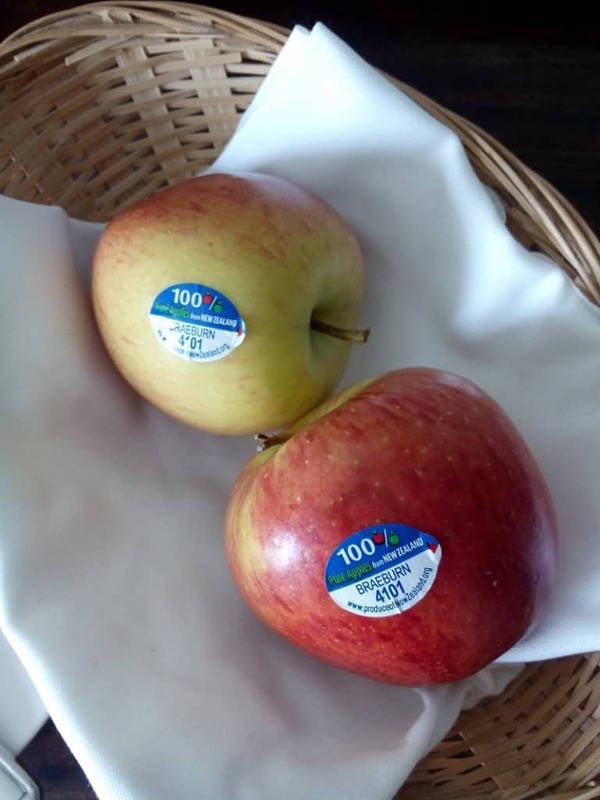 My state grows plenty of apples and even though it’s no apple season the stores are carrying apples from around the world instead. Just give me locally grown, imperfect apples like I grew up with. Aw, thanks! I have more holiday photos of random plastic and green solutions than I do of my family and my partner – oops! Too funny. ;-) Feel free to share them. I am always curious how other countries are handling the environmental problems. 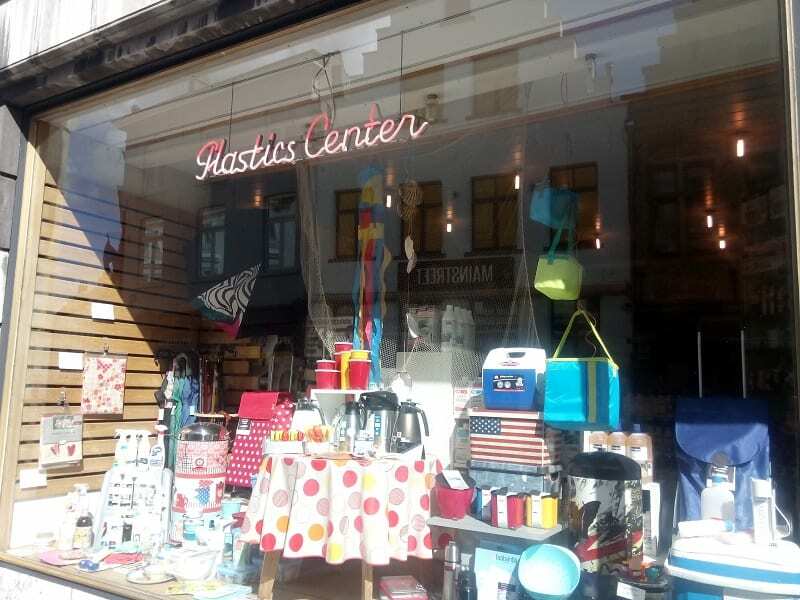 Really hated the plastic store I didn’t expect that. I hope you hear back from the hotel. It would be nice if they took your comments seriously and made the changes. That’s good. I’m glad he listened to you. What a really interesting set of photos.